The influx of speed came via the draft and free agency. As the players, and particularly the wide receivers, trickled into the Indiana Farm Bureau Football Center this past offseason there was no denying what they would be bringing to the Colts. There was the signing of free agent Donnie Avery who ran a sub 4.3 40-yard dash in becoming the first wide receiver selected in the 2008 NFL Draft. Avery had a career year in Indianapolis with 60 catches for 781 yards. The speed movement did not stop in free agency with the Colts drafting a pair of receivers known for stretching the field. T.Y. Hilton ran a 4.34 40-yard dash at his pro day and his big play ability led to 861 receiving yards and his seven receiving touchdowns topped all rookies. Fellow rookies LaVon Brazill and Nathan Palmer have also been timed in the 4.4/4.3 range in the 40-yard dash. When training camp got under away, wide receiver Reggie Wayne was in awe of the speed that he saw in his position group. Wayne wanted to get a race set up between the speedsters with the 12-year veteran serving as merely an observer. “Just make sure I’m at the finish line, not in there (the race),” Wayne said with a smile back during training camp. During Grigson’s time in Philadelphia, the Eagles were known for their electric playmakers at the skill positions and that attribute has been brought to the Colts. Grigson is hoping that speed costs Colts opponents for years to come. Cassius Vaughn’s interception return for a touchdown gave the Colts their first lead on Sunday afternoon but it was one offensive drive that got the comeback started, and another that gave Indianapolis the lead for good in earning its seventh victory in the last eight games. The scene: Down 20-7, the Colts take over following halftime at the 20-yard and a Rob Bironas touchback. The anatomy of the drive: Fourteen plays, for 80 yards in 6:24. After converting just one-of-five third-downs in the first half, the Colts had three of them on the opening drive of the third quarter. Key play: Reggie Wayne converted two third-downs on the drive but the third-and-11 at the Titans 38-yard line was truly spectacular. Wayne lined up to the right of Andrew Luck as a slot receiver. As Luck escaped pressure and rolled to his right he threw the ball up for Wayne and the 12-year veteran broke free from double coverage and hauled in his 28th third-down reception on the season. The score: On a third-and-goal from the one-yard line, running back Delone Carter punched it in with offensive lineman Tony Hills in the game as a tackle eligible. The Colts had their three tight ends lined up on the left side of the line of scrimmage and Carter ran behind them for his second one-yard touchdown of the season against the Titans. The scene: Down 23-21, the Colts take over following a Bironas 25-yard field-goal and a touchback, placing the ball at the Indianapolis 20-yard line. The anatomy of the drive: 10 plays, for 45 yards in 4:05. The drive included the Colts overcoming a second-and-15 and a second-and-10 as Indianapolis converted three first downs in regaining the lead. Key play: With the Colts facing a second-and-16 from their own 28-yard line, Luck went right back to wide receiver Donnie Avery. On the previous play, Avery couldn’t corral a high pass and took a hit from Titans cornerback Ryan Mouton. Avery got up slowly from the hit but on the next play he went high in the air again to gather an 18-yard reception and keep Indianapolis away from a third-and-15. The score: Vinatieri’s 53-yard field goal matched his season long and the 39-year old showed he still has plenty of distance left. The kicking game was terrific all afternoon and Vinatieri connected on both of his field goal attempts and is now seven-of-12 on the year from 40+ yards. With 88 catches and 1,156 receiving yards on the season, Reggie Wayne has been the focal point in the Colts passing attack all year long. Wayne has had at least nine targets in 11 of 12 games this season, yet Andrew Luck’s 503 pass attempts has allowed the rookie quarterback to incorporate several targets at different positions throughout the season. Behind Wayne is Donnie Avery (49 catches for 675 yards), who is putting career-high numbers in his fifth NFL season while providing numerous ‘chunk’ plays for the Indianapolis offense. A pair of rookies rank third and fourth on the Colts receiving list this season with T.Y. Hilton among the league’s best rookies with 39 catches for 588 yards and five touchdowns. Hilton admitted that he’s had a few rookie moments this season but his four 100-yard receiving games tells otherwise. Dwayne Allen has provided a versatile impact in the Colts offense with his 36 catches for 435 yards leading all rookie tight ends. Allen pointed out two more rookies who made an impact in the win over the Lions that have also benefited from the attention that No. 87 gets on a weekly basis. As the Colts head into the final quarter of the season, the depth at the receiver position is beginning to show and perhaps the most important point moving forward is you won’t hear anyone griping for the ball. “The selflessness of this team, the receivers, that’s really the reason we are able to spread the ball around like we do because if you have one guy that’s harping about getting more balls or needing more touches than that can really bring an offense down but we don’t have guys like that in this offense,” Allen said. 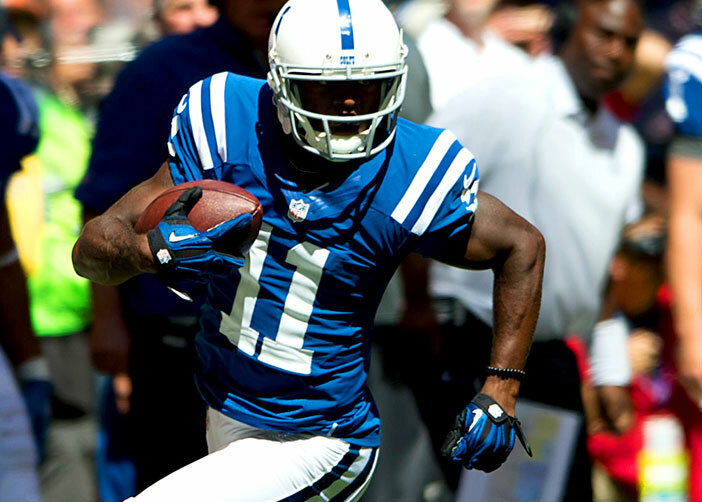 For the first time in the 2012 season, the Colts offense was unable to score a touchdown on Sunday. The Colts have scored at least two touchdowns in their first four games but the inability to finish off drives and protect the football limited the Indianapolis offense. In starting out each half, quarterback Andrew Luck and the Colts offense marched into Jets territory before drives stalled out on what interim head coach/offensive coordinator Bruce Arians called ‘manageable’ third downs. -On the opening drive of the game, the Colts reached the Jets 40-yard line before facing a third-and-one. On a play-action pass, Luck appeared to have tight end Dwayne Allen open in the flat but overthrew his fellow rookie. -The Colts defense forced a three-and-out and the offense was able to take over at its own 41-yard line. After a trio of first downs, the Colts had a third-and-one from the Jets two-yard line. Luck faked a handoff to running back Delone Carter, but threw it just over the outstretched hands of tight end Coby Fleener. The Colts would settle for a 20-yard Adam Vinatieri field goal. Arians talked on Monday about what he saw from his ‘amped’ up rookie quarterback in missing those two opportunities. “Just set your feet and throw it, you don’t have to throw those balls on the run. And take a little bit off of it because they’re there,” Arians said. -On the following possession, the Colts defense once again forced a Jets three-and-out. Indianapolis drove to the New York 48-yard line but on a third-and-three, Luck’s deep pass intended for wide receiver Donnie Avery fell incomplete. For the game, the Jets were 5-of-5 in red zone efficiency where as the Colts were 0-of-2. The four turnovers for the Colts was the focus coming out of Monday’s media session but in looking closer at the game, Arians knows the importance of converting ‘manageable’ third downs. “We got ourselves in very manageable situations and didn’t make the plays, especially early in the ballgame,” Arians said. Donnie Avery never questioned whether or not he would return to his old form. Taken as the first wide receiver in the 2008 NFL Draft, Avery caught just three balls the past two seasons after suffering an ACL injury in 2010. After a touchdown in Week 1 and nine catches for 111 yards on Sunday against the Vikings, Avery now has proof that he can be that player. Avery joined ‘Voice of the Colts’ Bob Lamey on Monday night’s Pagano Show. He said that he had ‘no doubt’ that he would return to the player that had a total of 100 catches for 1,263 yards in his first two NFL seasons. The 111-yard performance by Avery is the second highest in his five-year NFL career. He made numerous catches in traffic against the Vikings and his effort included a 41-yard grab in the first quarter to set up a Dwayne Allen touchdown. “We just were clicking, calling the right plays at the right time. I had opportunities to catch the ball and that’s what I did,” Avery said. The Colts signed Avery on March 26 in hopes to see the sub-4.3 40-yard dash speed that he had early in his career. Avery knows what got him to the NFL and his ability to stretch the field was something he keyed on during the offseason. A hip point injury forced Avery to miss the first two preseason games this year but since returning, he has been a steady option for quarterback Andrew Luck. At a time of uncertainty in his career, Avery has found an opportunity and a potential long-term home to showcase his skills. “I’d like to thank (coach Pagano). He called me in the offseason and he told me that I would fit in well here so I believed him and got on board with him,” Avery said.